Sweet! If you like, Lauren, you can send me a scaled drawing of your ..um... scale, and I could either replicate it for you as a cut vinyl transfer or as a print on a single vinyl sheet. Both should last the lifetime of the car, especially if you put a clear coat on the entire panel before you put a diffuser on. Rick, that would be just awesome! The mask is only 20cm long so its not large. File format is a bit of a headache though, I'm too tight to pay for software so I am using OpenOffice ODF drawing files (.odg). No idea if that is compatible with anything you have. I could save the file as a .bmp I think. I'm definitely interested! Techie question here. I can ID most of the parts on your board there. Lots of transistors, resistors and jumpers. Also I see a 555 time, a trimmer and a relay? What are the Red blocky bits? Capacitors? Is this the full she-bang for reading your speed and driving your linear speedo? It's a fine bit of crafting, Im just wondering what it all is. What are the Red blocky bits? Capacitors? Is this the full she-bang for reading your speed and driving your linear speedo? It's a fine bit of crafting, Im just wondering what it all is. Hi Nic - yes, the red blocks are polyester capacitors, 10nF and 100nF from memory. The 555 is used to generate a PWM output that dims the LEDs - the power transistor next to the polyester capacitor on the right is used to switch the earth return of all the LEDs with the PWM signal. The trim pot is used to change the PWM mark-space ratio, which causes the LEDs to flicker at high speed. The human eye has a lot of persistence and interprets the change in mark-space ratio as a change in LED brightness. The signal transistors in two rows on the right hand side of the board are the high side drivers for the hyper blue tachometer LEDs. Each transistor drives one LED segment. I had to use these to switch the LED current, because the LM3914s I am using to drive the segments can only sink around 10 mA on their own, and the hyper blues consume about 30 mA. The LM3914 bar graph driver is a separate board (not shown in the pictures). Ditto for the LM2917 tachometer interface. Huh, that lm3914 looks to be a pretty simple design, and easy to use IC. So, the VR1 at the bottom, connected to pins 2 and 3, is that what controls which LED segments are lit (D1 - D10)? And is the signal to pins 2 and 3 being fed by what ever speed indicating device (Im seriously lacking terminology right now, sorry) acting as VR1? That seems to be the only adjustable input in the above schematic. Unless I have the wrong schematic for your purposes. Hi Nic - that is the basic LM3914 circuit, VR1 is used to adjust the sensitivity of the input voltage range. My trim pot is used to control the brightness of all the LEDs, its a completely separate circuit. 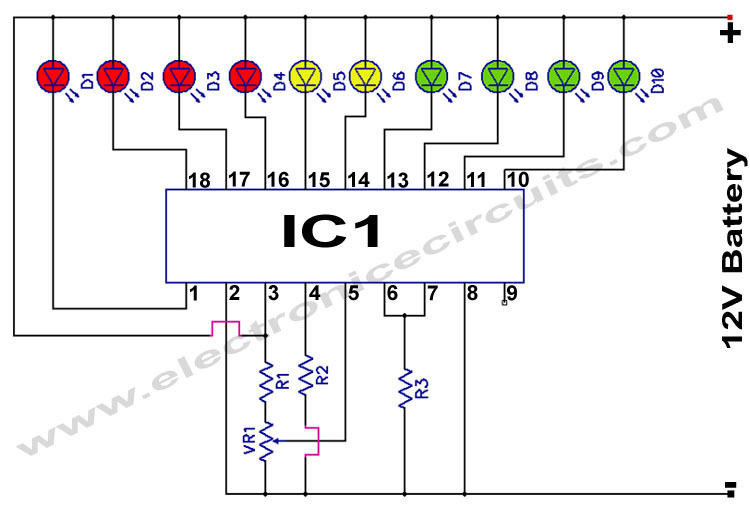 The basic circuit is fine for red or green LEDs with a foward current not exceeding 10mA in bar mode. In dot mode (where only one LED is illuminated at any one time) you could probably get away with more current, so maybe hyper blue or hyper red would work in this mode. Using resistors to dim LEDs results in very patchy performance, with some LEDs dimmer than others, depending on manufacturing tolerance. The beauty of PWM (Pulse Width Modulation) is that the LED is always on at its rated forward current, its just the time it is on for varies and this is what changes the perceived brightness. After reading up a bit, I found that the LM has an internal voltage divider and THAT is what measures and determines which LED's get lit. So the transponder at the front wheels? or transmission? sends a voltage signal depending on how fast the car is moving, it sends more (fast) or less (slow) voltage to the LM, which then in turn lights the appropriate LED. Yes? Yes, I am using an LM2917 precision frequency-to-voltage converter, which takes the pulse train from the ignition (its a tachometer, not a speedo) and produces a voltage proportional to the engine speed. But yes, you could equally adapt the same idea for a speedometer. Some more progress today. I bonded together the various heater elements ready for a layer of matt and resin to give it some strength. This is the air blender, with the fan below it in the air plenum chamber. The flap is used to block the flow of air to the heater core when the water valve (on the bracket at the bottom of the picture) is closed. With the flap closed all of the airflow exits through the circular port to the face vents. I've tried it and it works! Here's a virtual drivers-eye view of the monitor location. Steering wheel is also the right way up, which highlights the lack of visibility of the column stalks. I have a cunning plan to address this, but it might not be ready for a while yet, so I may have to get used to having the wheel in the "normal" position! As noted previously, the plan is to locate the Nav computer to the right of the monitor, with the speed next to it, then water temperature, oil pressure, fuel and volts in a line directly in front of the driver, with the tachometer over the top. I have scaled the dimensions of the tachometer display accordingly. ...Here is the Mk2 display mask in place, with 6.5 segments illuminated using the LM3914 driver board for the first time. Still some light leakage through the mask at the left hand end, but nowhere near as bad as I feared it would be. The camera obviously highlights this, to the casual observer it shouldn't be noticeable at all. Latest evolution of the PWM dimmer/LED driver board shows the LM3914 PCB at the top of the image, with the first 8 segments temporarily hooked up to the driver PCB. LM3914 PCB was purchased from Maplins years ago and is no longer produced unfortunately. Also you can see more rescued parts from my old PC, in the form of the 4-way power plugs, which I am using as the main power interface for all the circuits. The green screw terminal blocks allow me to common the connections to the other instruments - the middle one is +12V, RH is 0V, and LH is the sidelight connection for dimming the displays for night driving.